Dallas Arbiter, a British company owned by CBS, took control of Vox in 1972. They produced this excellent hand wired AC-30 Top Boost amp from 1974 through 1977. During this same period, Dallas also produced a version of this amp with reverb which included an Accutronics spring delay line. The introduction of these amps tell an amazing comeback story for both Vox and the AC-30. Both faced extinction in 1969. Here is the story. In 1964, Tom Jennings, the founder of Vox, sold a controlling interest in his company to the Royston Group, a large British electronics conglomerate. Through the middle and later 1960s, Vox continued to reward the Royston Group with handsome profits. However, Royston squandered the gains made by Vox in an unsuccessful attempt to develop a costly aviation radar tracking transponder. Eventually the losses suffered by the Royston Group in this futile engineering effort caused Royston to file for bankruptcy in 1967. Vox rose from the ashes of bankruptcy in 1968 only to fail again in 1969. Vox was again back in receivership, this time held by the Corinthian Bank. Under the control of the bank, Vox management was instructed to review all products and processes to lower manufacturing costs. It was determined that the hand wired tube amps that had driven Vox sales in the mid 1960s were now old fashioned and too costly to produce. A dual printed circuit board design for the AC-30 was devised and introduced. This new design proved to be undependable and was not well received, causing Vox to further fall out of favor in the marketplace. 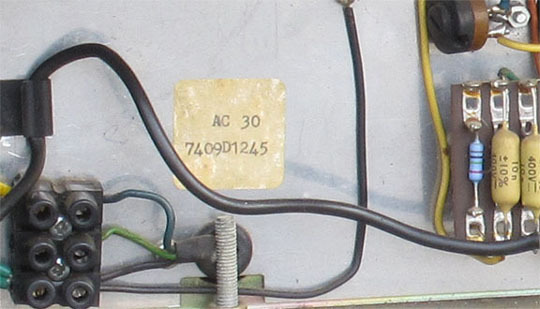 The printed circuit AC-30 offered by Vox from 1970 through 1973 can be easily recognized by the use of the American style rectangular Vox badge. This replaced the traditional -V-O-X- logo used on earlier and later AC-30 amps. 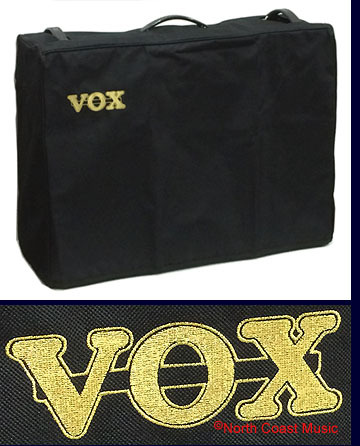 In late 1970, the Corinthian Bank sold Vox to a UK company called Birch-Stolec Industries. Birch-Stolec continued to produce the dual printed circuit board AC-30, now with or without reverb, plus some of the earlier transistorized models such as the Conqueror, Defiant, Supreme and Foundation Bass. See the Birch-Stolec era Vox catalog by clicking here. Vox had now become "yesterday's news" and sales continued to decline. In 1972, Dallas Industries, the UK distributor of Fender products and Sound City amplifiers, recognized an opportunity in Vox. Vox was again for sale and the asking price was right. A deal was struck between Stolec and Dallas and Vox production was moved to the Dallas Arbiter facility in Shoeburyness England. Dallas adopted the name "Vox Sound Limited" for their new enterprise. During the transition period from Stolec to Dallas, Dallas liquidated the existing stock of Stolec produced AC-30 printed circuit amplifiers, as evidenced in this 1973 Dallas catalog. 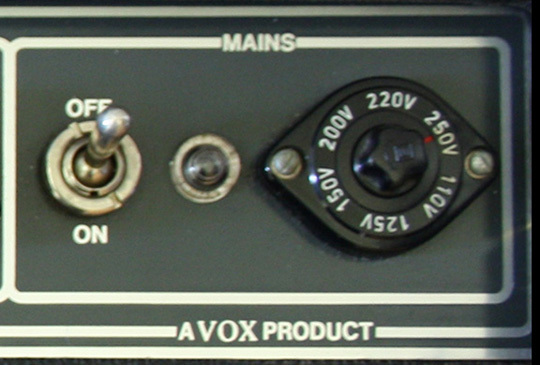 Early in their ownership of Vox, Dallas decided to discontinue the printed circuit version of the AC-30 and return the amp to the original hand wired, tag strip construction. 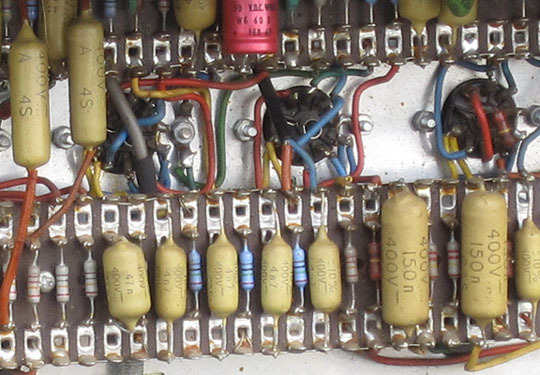 Several views of the hand wired Dallas AC-30 chassis, circa 1974, can be seen at left. The new amp was again made with the same care and attention to detail as when JMI made the AC-30. At the same time, Dallas also reissued the hand wired AC-50 amp along with several 1960's style Vox enclosures to mate with the head. 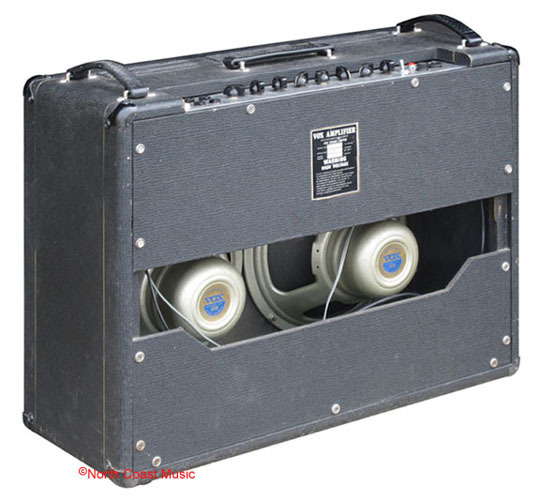 When Dallas purchased Vox from Stolec, they received about one hundred 12" Celestion Vox Alnico Blue speakers in the deal. This is significant because Celestion had discontinued producing this speaker a year earlier due to high costs. The first fifty or so of the new Vox AC-30 Top Boost amps produced by Dallas had the original Vox Alnico Blue speaker installed. After the stock of Alnico Blue speakers was depleted, Dallas Industries switched the AC-30 to a pair of 12" Celestion Green Backs. The Dallas Vox AC-30 shown in the pictures at left was produced in September 1974. 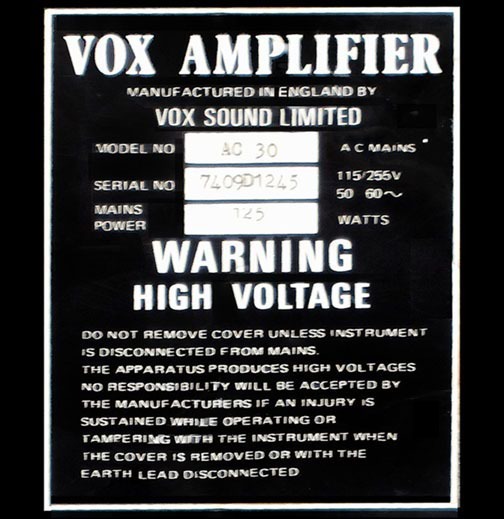 This amp shows the evidence that the AC-30 was returned to the original Vox design with only one significant exception. The GZ-34 tube rectifier was replaced with a diode bridge. The GZ-34 rectifier plays a significant role in the tone of an AC-30 by mildly compressing the output of the amp. This natural "sag" is lacking in versions of the AC-30 amp that have diode rectification. However, the use of diodes in the power supply also has a benefit. The efficiency of the diode rectification in the Dallas produced AC-30 allowed the amp to produce over 40 watts of output power. The tube complement of the standard, top boosted version of this amp included five ECC83, one ECC82, and four EL-84s. A second version of this amp that added reverb was introduced by Dallas in about 1975. This model increased the tube count to twelve by adding two more ECC83 tubes to power the reverb circuit. This early example of the CBS/Arbiter AC-30 Top Boost amp has a 13 ply baltic birch enclosure. 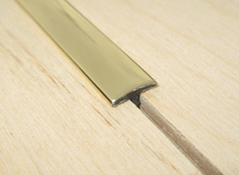 The cabinet had six slender JMI style air vents for improved ventilation. JMI produced Vox AC-30 amps had only three such air vents. 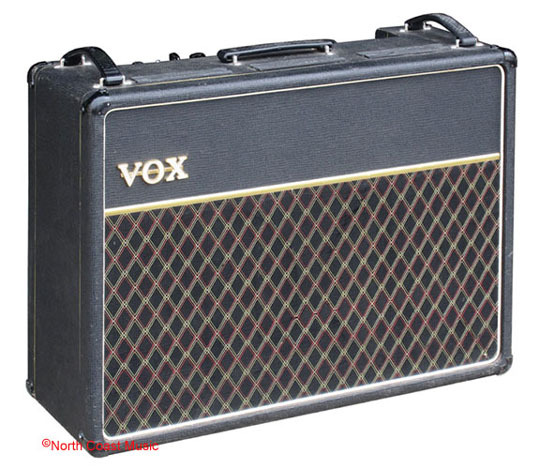 This hand wired version of the AC-30 continued to be built until Dallas Industries sold Vox to Rose Morris in 1979. Even after the sale was completed, the Dallas manufacturing facility in Shoeburyness continued to manufacture Vox amps for Rose Morris for several more years. Rose Morris offered the hand wired AC-30 through 1980 until a new, printed circuit based AC-30 was designed and built. 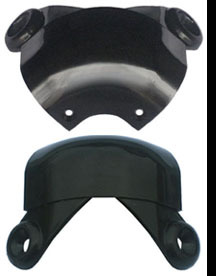 North Coast Music offers a large selection of replacement parts for the AC-30 amplifier.